Tall Grass Productions of Oklahoma recently collaborated with McCauley Sound's SYSTEM DESIGN GROUP to complete a design for a high school auditorium. 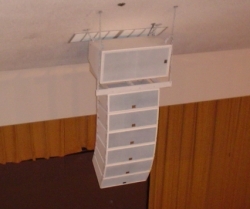 Working with a very long and narrow venue, and with the obstruction a return air duct to contend with, the designer ultimately specified a six-cell IN.LINE array, and added a single AC288 subwoofer module in an unusual but clever hanging configuration. "My interest is in the long throw as well as the short throw with the low frequencies going throughout the room." commented Jess Cullison, general manager at Tall Grass Producitons. Upon getting the system flown Jess had this to add. "Impressive."